Jesus rises, standing in a synagogue on the Sabbath. His fellow Jews gaze at him as he clears his throat. He reads from Isaiah. This is not just any synagogue in the backwaters of the Roman Empire, for it is the place of worship in Jesus’ hometown. Where he had been brought up, the Gospel of Luke declared. He is in a familiar room, once seen through the eager or bored eyes of youth, once a place where his father was protectively near him, once a place where—like all children—he might vanish behind an adult’s broad back or say something insightful and have everyone focus their attention on him. This was home. These were friends. He is Joseph and Mary’s kid. In a village, wouldn’t everyone have a memory? Was Jesus recalled as the child with the quick wit, or the far-away look, or the sad eyes, or maybe an infectious laugh? A hundred distinctive voices could say, I remember when: Jesus ran home, chased by an angry hive of bees or when he stayed by Joseph’s side and helped his old man finish a carpentry project or was the one who found that lost lamb after it wandered from the flock. They would remember. He was one of theirs. All of them in the sweltering, stark place of worship had yelled at, nodded to, chatted with, scolded, praised and greeted the boy Jesus. He’s a man. Grown. Up. Rumors about Joseph and Mary’s son included an encounter with the oddball John the Baptizer while the Jordan’s muddy water flowed around them. A few Pharisees were overheard whispering about the “trouble-maker from Nazareth.” Even a Roman soldier had recounted a story that he said Jesus first told. There was (pardon the modern phrase) some buzz about the local lad. There were snippets of discussion about the length of time he wandered in the wilderness. All by himself, some said. Didn’t take any food, others guessed. Gone for weeks. No, it was only for days. Never happened, a few mutter. They might argue this, but no one had asked Jesus how long, where, why, or even if. Sometimes, isn’t it more fun to gossip and speculate? Why cringe? Because they are the poor and forgotten. None in Nazareth’s synagogue will ever trod the boulevards of Rome. They don’t need to visit to understand that faraway city’s opulence, its emperors, its weapons and wealth and wrathful ways. Those distant rich lord over these poor fools. Everyone they know in Galilee—yes, damn it, every single blessed and cursed one of them—is poorer than the hardscrabble dirt they till. If they lose a lamb or a harvest or even a single Roman coin with Caesar’s contemptuous profile, they’ll barely survive the next season. All who just heard Isaiah have hungry children and wives bent and wrinkled before turning thirty. They’ve buried too many infants. They know too many widows and orphans. They are Isaiah’s the poor. They are the ones who futilely dream of good news. But it seems a hollow dream. Clouds don’t have silver linings; there are just more clouds. 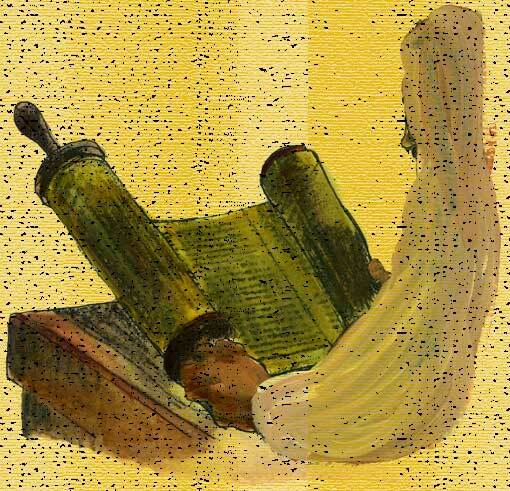 He relinquishes the scroll with the scrawled longings of Isaiah to an attendant. Steady hands roll the old, crinkled hopes into a tight cylinder. Someone coughs. A man steps on his neighbor’s toes and there’s a yelp. A door opens and closes. Candles sputter. Flies buzz. An old fellow is sobbing, like he does every Sabbath. The scroll is tucked away, safe in its proper spot, as harmless as a faded wine stain on a table. There’s a hush. Unexpected silence. No whispering. Even the old man stops weeping. Some see Jesus clearly. Others peer around the shoulders of the worshipers in front of them. There are those with no view, but all wait . . .
Do you recall that feeling, on the verge of asking your beloved if she or he would marry you? Do you recall that feeling when you anticipated voicing the awkward words of forgiveness to the friend hurt by your actions? Do you recall that feeling just before talking about the birth of your child or getting your first “real” job or the acceptance into the college you never thought would say yes to you? It is the silence before the revealing. It is that moment of hope, promise, possibility, expectation, when what has been dreamed may, might, could, perhaps will become reality. Not a whisper. Not a cough. Breath is held. All eyes are wide open. They are no longer poor. They are no longer forgotten. They are no longer without power. The synagogue thrums with hope. I enjoy your musings. Keep it up. I shall endeavor to, Ruth!! Thanks for the comment!